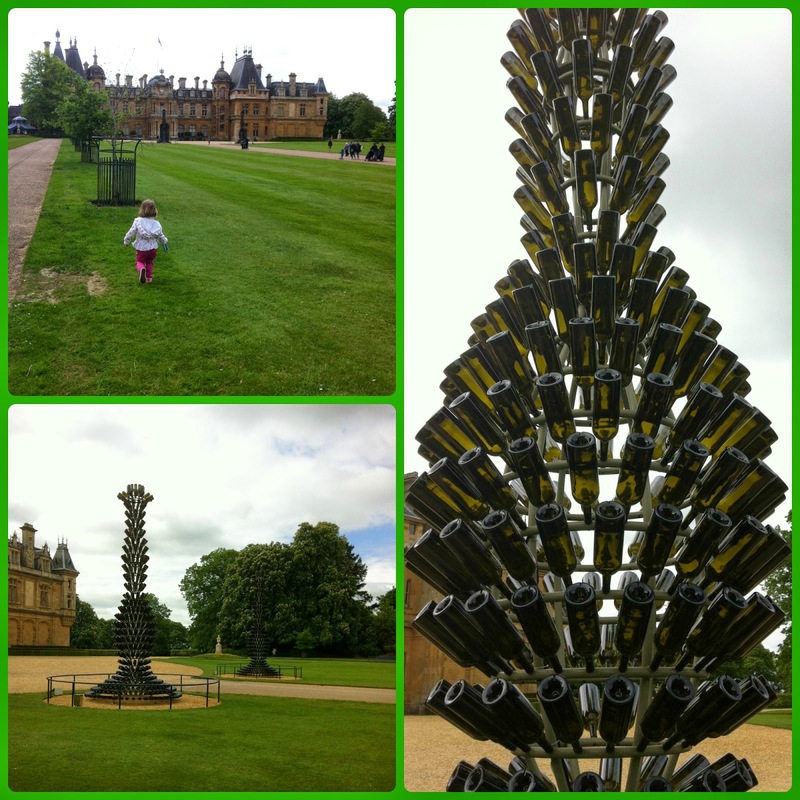 We decided to brave the crowds and visit Waddesdon Manor again this morning. On previous visits we've tended to visit the same areas of the Gardens, so our objective today was to just spend a couple of hours there and explore some different parts. We certainly did that and had a fab time! We arrived early and the car park was still quite empty so we even got a space in the Parent & Child area! A quick hop on the bus and we were at the Manor. We walked up the North Avenue and saw the new candelabra sculptures by Joana Vasconcelos. You wouldn't know they were made entirely of glass bottles from a distance. We then headed around the Manor to the left. We've not been this side so had no idea this is where the shop is located along with a Coffee Bar. We then spent some time on the Parterre. Last time we visited this area was in the winter when there was no planting. It was really pretty today with all the colourful planting. 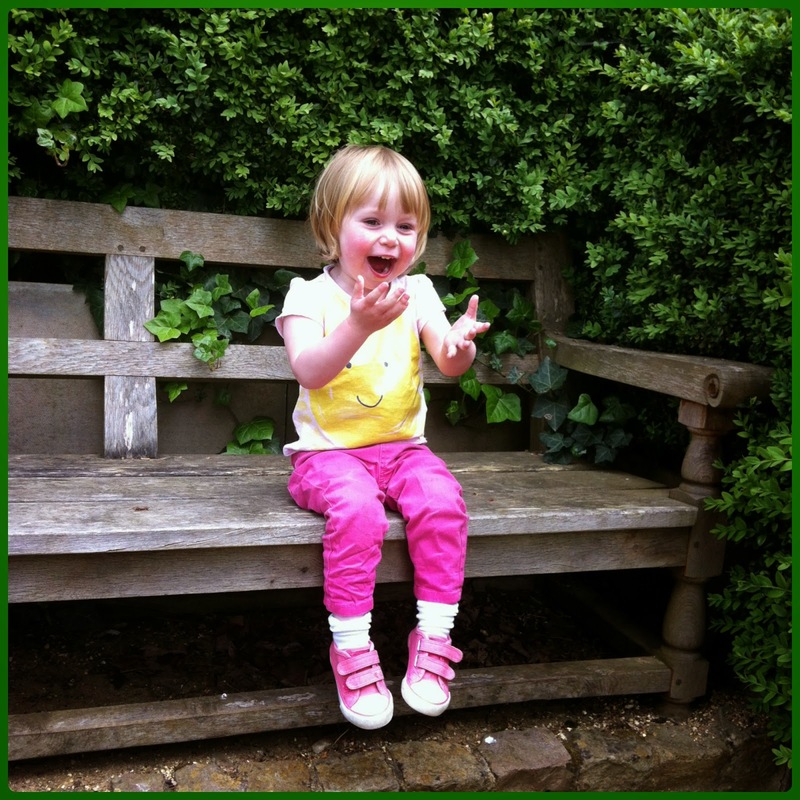 Mr MoaB threatened to throw Little Miss A into the fountain which she found hilarious! 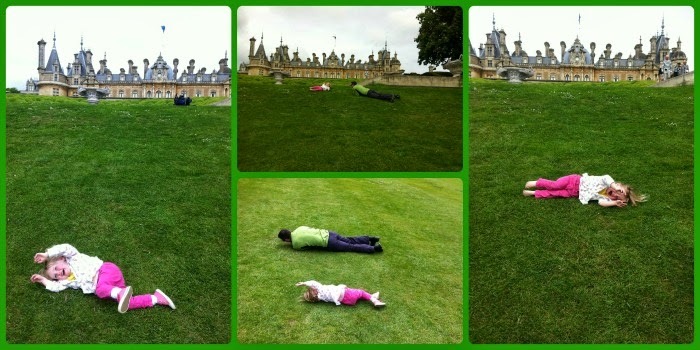 We then wandered down some steps and found the perfect hill for hill rolling! I can't believe how quickly Little Miss A got the hang of this and she must have gone down at least half a dozen types with much laughter! This is no. 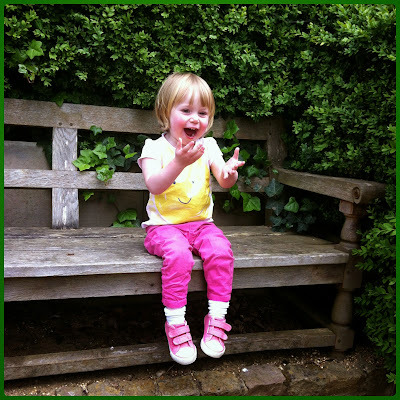 2 on the National Trust 50 Things To Do Before You're 11¾ - Roll down a really big hill. So we can definitely tick this one off the list! Next we took a wander around the Daffodil Valley and headed towards the Aviary, as Little Miss A always likes seeing the 'birdies', before taking in some more of the gardens. There was even a spot of dancing on the tree stump! 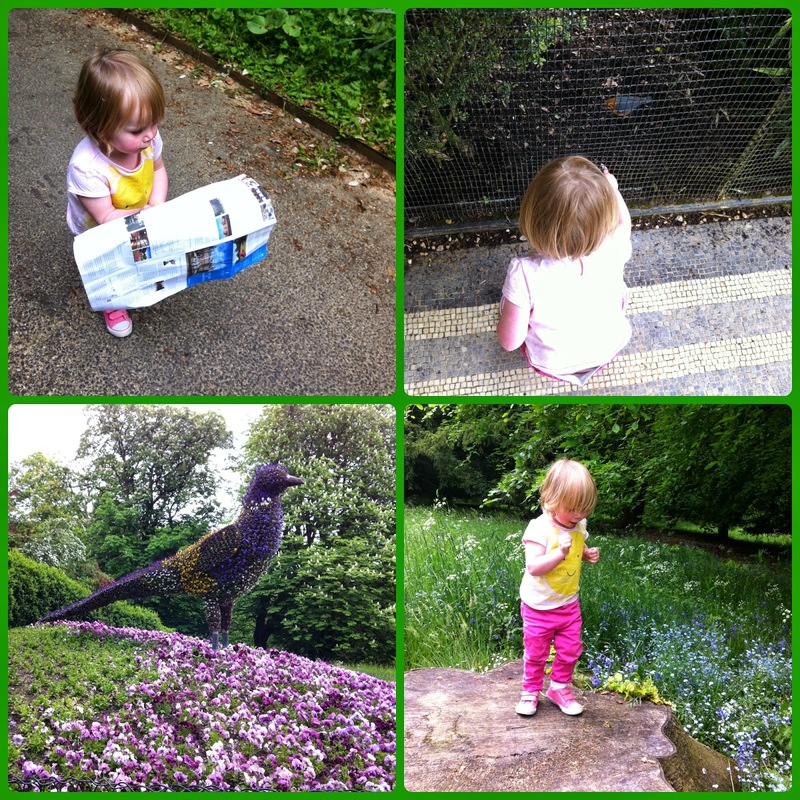 Though we only spent a couple of hours at Waddesdon today we had such a fun time. Little Miss A was on top form and just had us entertained the whole time. I think this is my favourite picture of her from today with such a big happy smile. 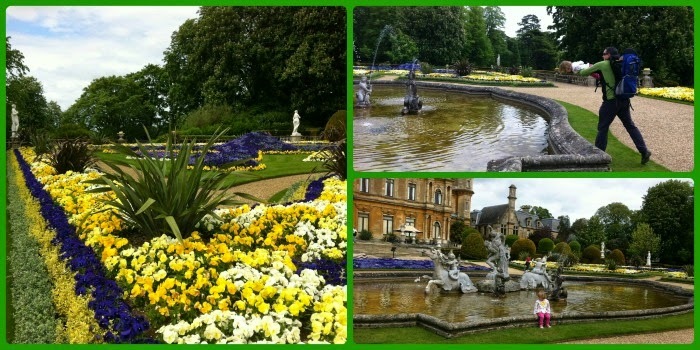 We are so glad that we headed to Waddesdon so early today. As we were walking around there were times when it felt like we were the only ones there! Hard to believe on a Bank Holiday Monday. It was definitely a good decision to explore the less 'popular' areas and go on the path less travelled. By the time we were leaving, everywhere was really busy. People were streaming up North Avenue from the bus. There were quite long queues at the Coffee Bar so we decided to try out a new local cafe in Waddesdon called 94 Coffee Shop. It was a good option for a quick refreshment and treat of some cake before heading home. Another really great visit to Waddesdon - our 5th this year and there's still 7 months of our National Trust membership to go! Hill rolling was definitely the highlight of the day!